In recent days LED Dot Matrix displays widely used for displaying information to wide range of people. The Dot Matrix displays can be used in all indoor and outdoor purpose, in all areas like as railway platforms, traffic signals, public offices, hotels, shops, institutes. LED Dot Matrix Displays cheap cost as compared to LCD's but interface point of view LCD Displays are best, LCD's easily interface with a microcontroller for displaying information. This project completely works based on the GSM by using 8-digit dot matrix LED display. The display can shows upto 8-digit message send by mobile phone from any where. The display massage signal sent by mobile phone, which is works on GSM network by inserting mobile number SIM card. The sige of the Dot Matrix LED display is 7x40, and it is designed by 5x7 dot matrix LED modules. Fig.2 GSM based Dot Matrix Display Block diagram. 1. 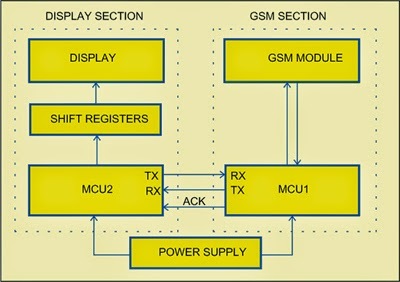 The above fig.2 shows GSM based dot matrix display block diagram for moving display messages the total project design and implement in two sections, such as GSM section and Display section. 2. In GSM section, insert the dedicated SIM card into the GSM module and microcontroller unit (MCU1). 3. When the new message is received from GSM madule, MCU1 receives the corresponding the GSM module. 4. In display section, here circuit comprises 7x40 dot matrix display and microconroller unt (MCU2). here MCU2 receives the message from MCU1 serial interface. Fig.3 Circuit Diagram of GSM Based Dot Matrix Display. 5. In fig.3 shows the circuit of GSM based dot matrix LED display, and its comprises of two P89V51RD2 microcontrollers (ie.IC9 and IC10), 5V regulator 78S05 (IC12), and shift registers (IC1 to IC8) driver unit (IC11), MOSFETs (T1 to T5),Dot matrix module 5x7 (DIS1 to IC8). 6. This circuit needs the 12V,3A DC supply by 230v AC stepped down by transformer X1 the out put of the transformer is rectified by full-wave rectifier and its using four diodes D1 to D4. And filtered by capacitors C12 and Regulated by IC12. 7. 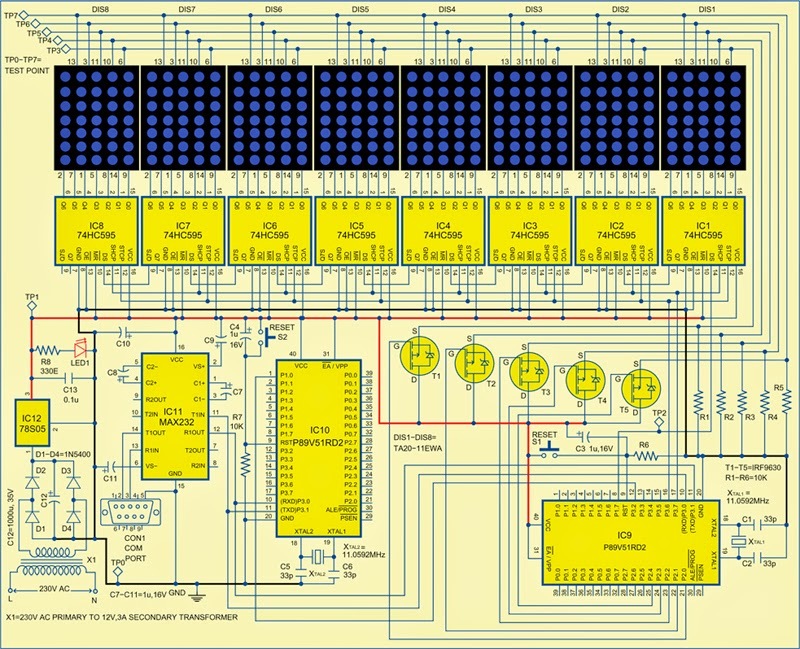 The microcontroller has 8-bit with 64kb Flash and 1024 bytes of RAM. It has three 16-bit timers/counters, and four 8-bit input/output ports. The Flash program memory supports both parallel programming and serial in system programming. 8. The microcontroller IC10 is interfaced to the GSM module by using driver MAX232. GSM module operates same as cellular phone. here SIM300 is a triband GSM/GPRS Network on EGSM 900MHz. 1 Response to "Dot Matrix LED Display Works Based on GSM"